Oggi pomeriggio il cielo era solcato da grandi nubi violacee in movimento da est verso ovest. Verso il mezzodì si accalcavano sopra il crinale, in formazioni torreggianti, poi hanno sfondato e si sono riversate sulla valle, veloci, allargandosi e scontrandosi, spinte dal vento ad ammucchiarsi verso il M. Pelpi, dove poi hanno scaricato il loro carico di pioggia. Con Lorenzo e Giovanni abbiamo iniziato un nuovo tratto del Percorso Natura, costruendo cinque gradoni in pali di castagno, per scendere verso il faggio piantato anni fa. Per tutto il pomeriggio hanno cantato i luì bianchi, due torcicolli e a tratti il cuculo e il rigogolo. Nel prato sotto il pozzo sono in fiore centinaia di Ornithogalum narbonense. This afternoon the sky was crossed by large violaceus clouds moving from east towards the west. 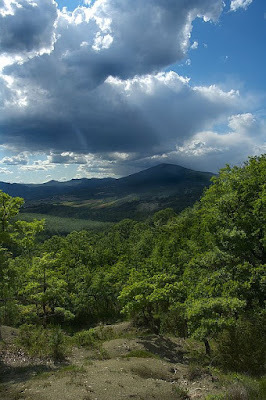 Around midday they crowded over the ridge in towering formations, then they broke and spilled over the valley, quick, enlarging and clashing, pushed by the wind to pile over the M. Pelpi, where then discharged their load of rain. With Giovanni and Lorenzo we have started a new section of the Nature Trail, five steps built with chestnut poles, which decline towards the beech planted years ago.For all the afternoon long sang the Bonelli's warblers, two wrynecks and every now and then the cuckoo and the oriole. In the meadow below the well were in bloom hundreds of Pyramidal Star-of-Bethlehem.